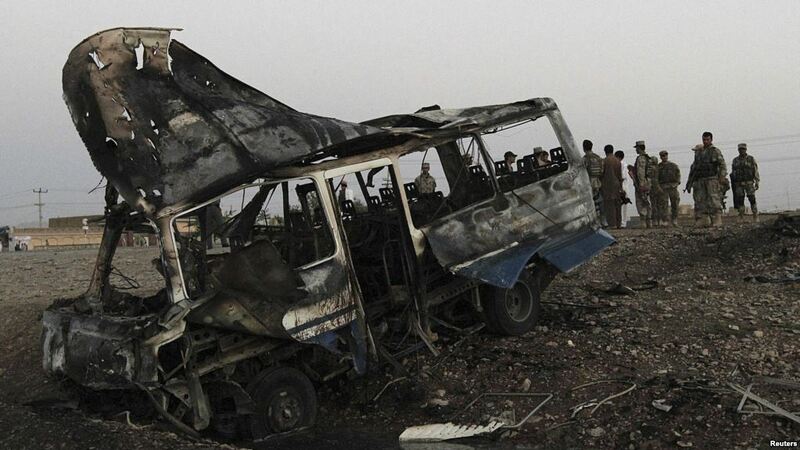 KANDAHAR: A minibus packed with explosives blew up in the southern Afghan city of Kandahar on Tuesday causing dozens of casualties, officials said, as fighting continued across the country during the Muslim holy month of Ramadan. The blast, near one of the city’s main markets, sent a huge cloud of dust and smoke into the air. Nematullah Barak, head of Mirwais hospital in Kandahar, said six dead and more 38 wounded, including several children, had been brought in. A statement from the NDS intelligence service said the minibus, packed with explosives, was discovered in a large open yard of mechanics workshops but blew up before it could be defused. Hundreds of people have been killed or wounded in high-profile bomb attacks since the beginning of the year, many in the capital Kabul, but provincial cities have also been hit as the Taliban, seeking to reimpose hardline Islamic rule, have stepped up fighting across the country. Kandahar province, on the border with Pakistan, is a major center of opium cultivation and a stronghold of the Taliban but the city has recently been relatively secure. Tuesday’s explosion came as the Taliban pushed ahead with their spring offensive, launched last month, with fighting in other areas of the country. Arif Noori, spokesman for the provincial governor, said a large Taliban force, armed with heavy weapons, attacked government positions in five districts of the province late on Monday, with fighting continuing until dawn. Insurgents burned down the police headquarters in Jaghato district, he said. The latest fighting coincided with a US government report that found few signs of progress so far this year, with fighting spreading across the country and hundreds of casualties from high profile attacks in Kabul and other cities. Security officials say violence is expected to pick up as preparations continue for parliamentary elections scheduled for October.